Tens of thousands of the Yarmouk "Palestinian refugee" camp in Damascus flee as Assad's army attacks advancing rebels. Syrian rebels made advances on Tuesday in fierce fighting for a refugee camp in south Damascus that is home to registered "Palestinian refugees", sending tens of thousands of residents fleeing as the army prepared a counter-attack and carried out fresh air raids. According to an AFP report, the United Nations Relief and Works Agency (UNRWA) said at least half of the population at the Yarmouk camp, which is home to more than 112,000 people, had fled the violence rocking the camp. Previous reports indicated that the rebels had already succeeded in taking over the camp. AFP reported that there was an influx of hundreds of Palestinians into neighboring Lebanon in the face of the fierce fighting between Syrian rebels and their Palestinian allies, and factions still loyal to Damascus. President Bashar Al-Assad's forces carried out several air raids on the Yarmouk district, as people were fleeing the area, the Syrian Observatory for Human Rights told AFP. Earlier air strikes targeted the eastern outskirts of the capital as well as the southern district, killing three civilians, and clashes also erupted near the airport road, the Britain-based watchdog said. It said 98 people died in violence nationwide. Days of heavy fighting in the camp haev pitted rebels against fighters of the Popular Front for the Liberation of Palestine-General Command loyal to Assad. PFLP head Ahmed Jibril was driven out from the camp by opposition forces. The defectors have called for Jibril's arrest. The population of the camp had halved by Tuesday, according to UNRWA. 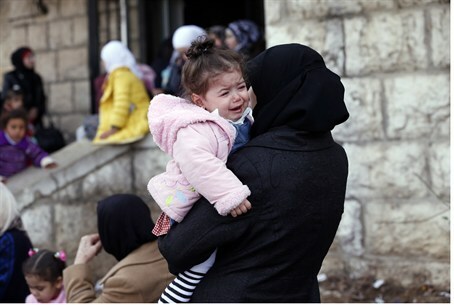 "Our conservative estimate would be that at least 50 percent of the people living in the Yarmuk suburb have left or are leaving, taking refuge in other parts of Damascus, UNRWA schools and facilities or leaving altogether," spokesman Sami Mshasha said told AFP. Yarmouk came under heavy attack from the Syrian army on Sunday, as a mosque that was sheltering some 600 refugees from neighboring districts, was attacked from the air and hit by at least one rocket. Reports indicated that at least 25 people were killed in the strike. Meanwhile, Turkish Foreign Minister Ahmet Davutoglu urged Syria's key regional ally Iran to "send a clear message" to the Assad regime to stop the violence against its own people.